The spare Main is unused as new. Cruising Chute Snuffer is available. The Anchor chain and warp is new. New mooring lines, chains and shackles. This excellent sail boat comes with a road trailer, a 2015 Outboard and by separate negotiation a mooring on the River Exe. This was one of the very last 21's made and is in exceptional condition throughout. Epoxied from new, benefiting from a self tacking Jib and with a ballast ratio of nearly 45% is a very stable boat whilst also being light and fast. 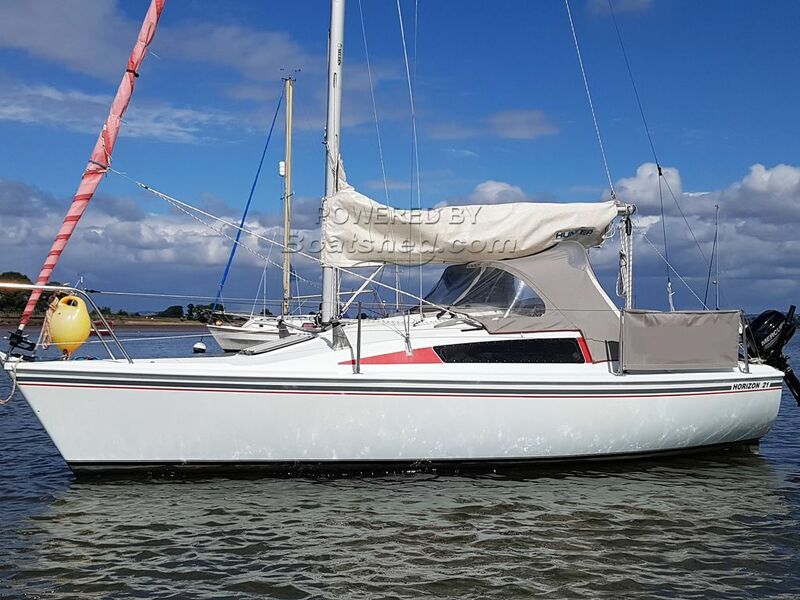 Practical Boat Owner said of these "a fine little cruising boat from a well proven hull that is fun to sail"
The current owner has clearly cherished her with many improvements, including new tiller, new companionway woodwork and new interior linings. Only two owners from new, taken out the water each winter, not in the water for 6 of those years. This really is the perfect starter package for a family or crew wanting to start sailing, and probably the best Horizon 21 on the market. This Hunter Horizon 21 has been personally photographed and viewed by Phil Key of Boatshed Torquay. Click here for contact details.